3M'S BEST FILM ON THE MARKET - It works very well in protecting a motorcycle's paint from scratches caused by things like errant zippers; motorcycle seats rubbing against painted parts; chafing caused by motorcycle clothing and of course, stone and bug dings. Paint protection film works great on the front of a motorcycle's fairing, on an air dam, or on any bodywork located in back of the front tire. It also works great on the sides and the back of the fuel tank; on the sides of the battery covers to protect against scratches from motorcycle pants; on top of the fuel tank to protect against tank bag scratching; and basically anywhere else where the paint needs protecting. Unrivaled stain and scratch resistance: The revolutionary clear coat technology produces exceptional stain and scratch resistance, making it easier to clean and harder to scratch, ensuring that it keeps the vehicle looking newer, longer. Self healing properties: Innovative technology allows minor scratches to disappear by themselves, keeping the film and your vehicle finish looking new. Excellent durability: The new formula for the Scotchgard Pro Series has superior resistance to yellowing and cracking, ensuring that your vehicle finish retains the showroom quality, color and design features. A: Yes, there is a bit of a trick to it and I have a video to show how. Basically you want to pull and stretch the material so it pops off but if you peel it back like a banana then you will get that residue left behind. Q: Does the film come in different colors? A: Nope, It only comes in clear. You are buying one Custom Made Motorbike Paint Protection kit made with 3M 948 PRO SERIES product. This tough, durable, virtually invisible, maintenance-free urethane film uses our most advanced technology to protect the finish on your vehicle and keep it looking newer longer. 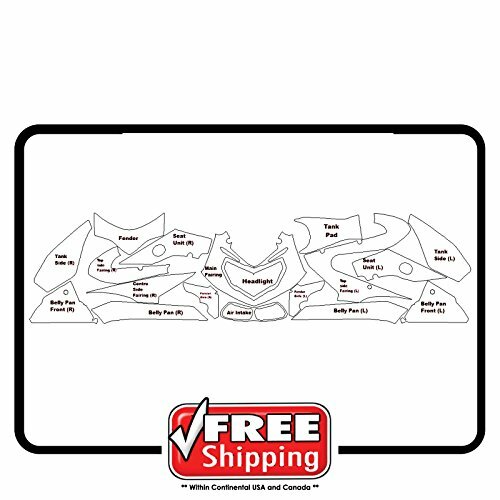 We Have over 20,000 templates and images in our software covering cars from 2002-Present. If you have any questions about this product by PrintsnPlots, contact us by completing and submitting the form below. If you are looking for a specif part number, please include it with your message.